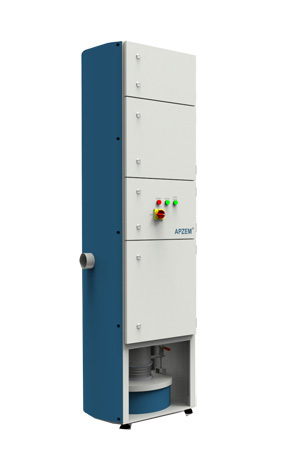 Apzem® PVC Pro series Laser Fume Extractors are specially designed Extraction and filter units catering to the demands of medium to heavy duty Laser Processing on PVC Materials. Laser Marking, Engraving, Cutting and other laser processing on PVC material generates highly corrosive HCL fumes and normal Laser fume Extractors will not be able to perform well in PVC lasing applications. Apzem® PVC Pro series Laser Fume Extractors are specially made out of stainless steel materials and all internal surfaces are Epoxy coated to increase corrosion resistance and to perform well in PVC Lasing applications. Laser processing on PVC (Polyvinyl chloride) generates Hydrogen chloride fumes that is highly corrosive in nature and will corrode all nearby machine components made of Iron steel, Hence this fumes has to be removed as soon as it’s generated. Normal activated carbon filters will not be able to adsorb HCL molecules. It can be completely adsorbed only in chemically treated alumina balls adsorption media. All our PVC range of Laser Fume Extractors comes with three stage of filtration ( Deep pleat primary filters, HEPA filters and deep bed blended chemical filters) capable of completely adsorbing HCL fumes and also filters out ultra fine plastic particles 0.3 microns sizes at 99.997% efficiency. Making the filtered air free from odors, dust particles and hazardous and corrosive gas molecules and can be recirculated back into the room. Flow :500 to 1000 CFM. All our PVC Pro extractors comes with digital display and controls with feather touch keypad that boosts usability and increases productivity and safety. Special attention is given for sound proofing and noise reduction using advanced silencing technologies and sound absorbing materials. All our Apzem® PVC Pro® series professional fume extractors were designed with bottom up air flow path that decreases dust loading on filters as heavier dusts get settles down by gravity and only finer dusts gets accumulated over filter bags. This special design enables longer filter life and would works well in applications generating more dusts without filters getting choked. The filtered out air from fume extractors can be recirculated back to the Air-conditioned building giving good savings on heating and cooling costs in long-term. Choosing right extractors with right filtration always boosts productivity and safety of the operator, Machine and product quality.